The Vietnamese low-cost carrier VietJet has signed a Memorandum of Understanding with Boeing on Wednesday at the 2018 Farnborough International Airshow for an additional 100 737 MAX aircraft. The deal is split between 80 737 MAX 10s and 20 737 MAX 8s and has a list price of $12.7 billion at current list prices. 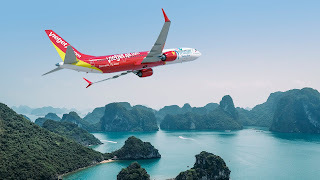 If this deal is completed, VietJet would become the largest MAX 10 operator in Asia and would use the MAX 10 aircraft to satisfy the surging demand on high-dense domestic routes, as well as on popular destinations throughout Asia. "We are excited to introduce Boeing's newest 737 MAX 10 into our rapidly growing fleet. These new airplanes will fit perfectly into our growth strategy, providing the efficiency and range for VietJet to expand its route network and offer more international destinations for our customers and expand alliances across Asia Pacific, the fastest growing aviation market in the world," said Madam Nguyễn Thị Phương Thảo, President and CEO of VietJet.